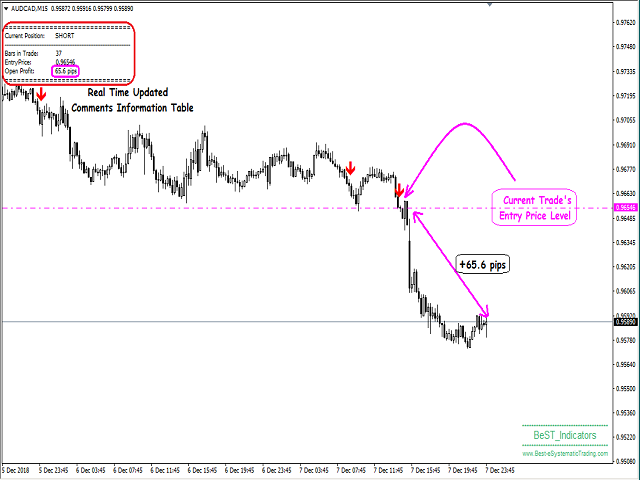 BeST Trend Scanner is an MT4 Indicator that uses a proprietary algorithm in order to identify the most likely levels and probable moment for an upside or a downside trending price move. BeST Trend Scanner is a useful tool that is trying to simplify the Entry Process and also to capture the most of every trending move of prices. This indicator protects from prematurely exiting of a trade as well as detects rapid and significant changes of market conditions leading in an Exit from a trade and at the same time in Reversing of our Position in the Market. Obviously it can be used for both sides of the Market (Long & Short) and in this way operates automatically detecting the appropriate side of the price move. 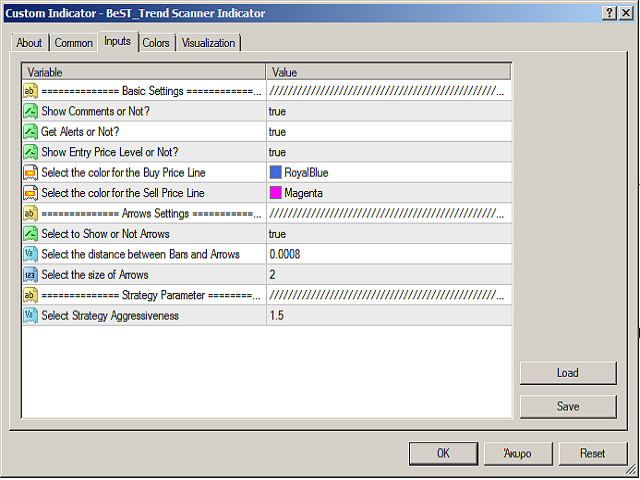 Additionally the BeST Trend Scanner Indicator defines in advance and with a high statistical percentage of accuracy the subsequent Resistance & Support Levels of the anticipated upside or downside trending move of price and so generates Buy or Sell arrows at the beginning of an Uptrend or Downtrend respectively but also during the development of the corresponding trend while also sends immediately an Alert Message and so in this way the Indicator offers the chance for daily trading with favorable probability. It is important to emphasize that even though the losing trades are not missing like in every trading system or method, usually the losses they give are less than profits derived from the profitable ones. (i.e. 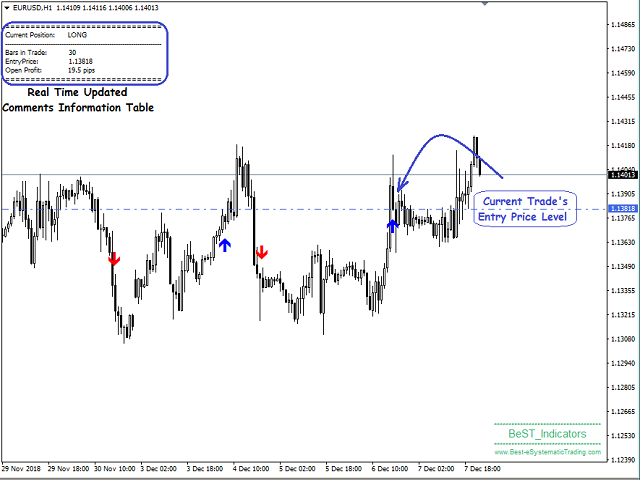 some signals can make a profit up to 150 - 200 pips or more). It is also important to note that this particular tool does not accurately define the Exit from a trade since it deals exclusively with the identification of appropriate points of Entry into the market. So it is necessary the parallel use of a good Exit Strategy along with an appropriate Risk and Money Management method as this Indicator is not a complete and proven system. 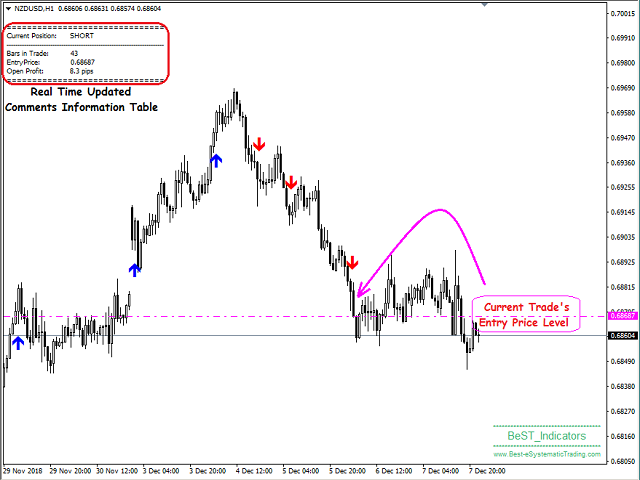 We can use H1 and M30 timeframes in order to determine the trend (both must give the same Signal) and after this we can wait for the same signal in M15 timeframe to enter the trade. · The Current Position Type: Long / Short / Neutral. · The Number of Bars for which we are In the current Open Trade. after the Signal (Signal = Arrow). Note: All the above are updated in Real Time. Get Alerts or Not for selecting to get or not an Alert Message immediately after a Buy or Sell Signal (Arrow). 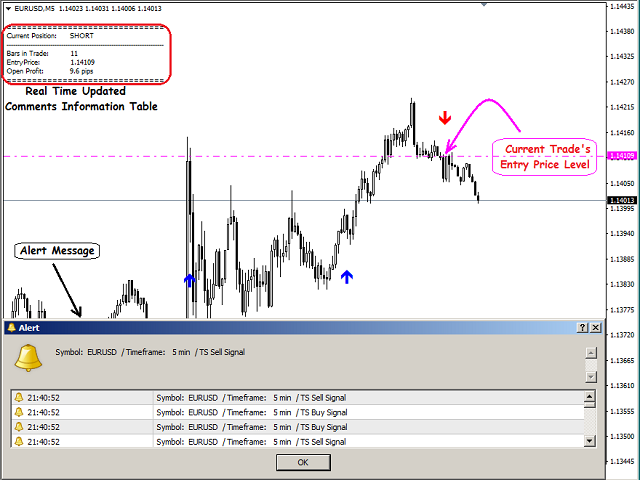 Show Entry Price Level or Not for selecting to Show or Not on the Chart an horizontal line representing the level of the theoretical Entry Price in each trade, i.e. 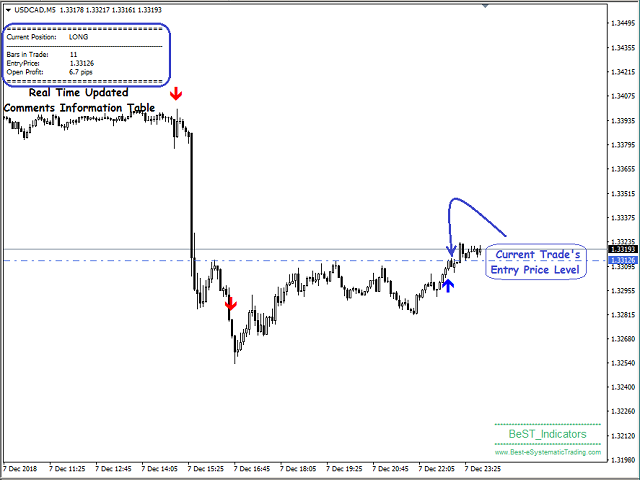 the Open Price of the next bar after the Signal (Arrow). Select Strategy Aggressiveness for selecting through a multiplier factor the aggressiveness of the underlying strategy meaning the number of arrows produced.